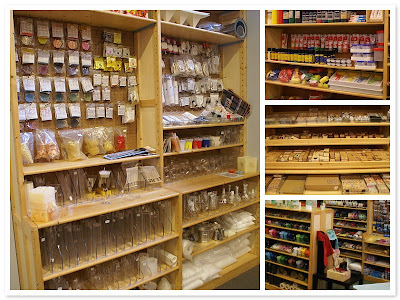 ... going back to work isn't so bad after all if you work in a craft supply shop? ;) I wanted to share some pictures of the place I work. It's full of color so it's a happy place. Two days a week, I work in the shop. 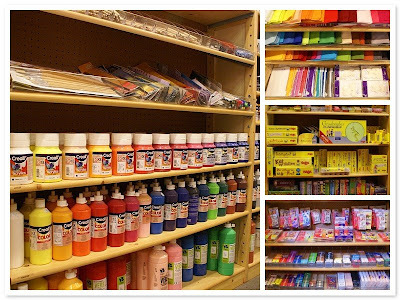 It's a shop were they sell over 12.000 products ranging from craft supplies, children's books, creative books, games, juggling materials, music instruments and the uniform of the youthclub it is part off. Having such a diversity of articles makes it double fun as there's also a great diversity of people. I love being asked difficult questions so I get to search for the right answer. Sometimes I don't know the answer and then I'm on a quest to find out. :) I love the contact with the customers and I always try to make shopping a happy experience for them. I think that makes it fun for both. The other three days of the week, I work in the headoffice of this chain of stores in Antwerp.